Writer Alex C. of The Firearm Blog, one of the most popular gun related blogs in the world, recently took an afternoon to check out Nashville Armory, Tennessee’s newest shooting range installment. Nashville Armory has only been open for a few short months but is already making a huge splash in the firearms community because of its friendly environment and unmatched range technology. The 15,000-square-foot facility boasts a huge inventory of guns, ammo, shooting accessories, and even a shooters’ lounge where customers can grab a snack and a drink. Besides the retail and amenities, however, Nashville Armory’s claim to fame is its advanced indoor shooting range. 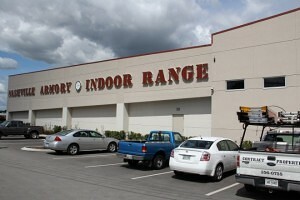 The indoor range features two 75-foot bays with eight lanes each, a Total Containment Trap from Action Target, bulletproof glass shooting stalls, wireless target retrievers from Mancom (a subsidiary of Action Target), and 75-cubic-feet a minute ventilation provided by Carey’s Small Arms Range Ventilation. Over the course of my life, I have probably waddled into no fewer than twenty or so indoor gun ranges. I love a quick visit to an indoor range to test a few pistols, have a short bit of fun, and get out quickly because the facility is usually either too hot or cold (depending on time of year), filled with lead particles and spent powder in the air that seems to linger forever, or be so dark and dank that at longer ranges you can barely see the holes you punch in the target. I am proud to say that on the advice of a friend of mine I got to check out what I believe may well be the finest gun range I have ever set foot inside. On Monday, May 6th I hopped on a plane and flew from Dallas to Nashville to check out this facility that I had only seen a few photos of hoping that it would be all it was cracked up to be. Let me tell you that without a doubt, it was. Gary is the owner of Nashville Armory, but you wouldn’t know it if you were an unassuming patron. You see, Gary says that he likes to meet all of his customers at the door with a smile taking to the Walmart-greeter method (his words, not mine), and immediately you feel welcome. This stands in contrast to some other gun shops/ranges where the staff makes you feel privileged for being allowed to patronize their establishment. Now what makes Nashville Armory different you might ask? Well, I asked the very same question to Gary and he said simply this: “I wanted to set out and build the Apple Store of gun ranges; A one stop shop for firearms, equipment, classes, and training that would be family friendly and inviting”. Now that is a bold statement, but Gary has made it work and after the tour it is easy to understand how. Read the full review on The Firearm Blog. Action Target engineers are doing more on the beaches of Florida this spring than just surfing or getting a tan: they are designing the biggest bullet trap ever built. Lotus Gunworks of Jensen Beach, Fla., will be opening its doors next week and inviting shooters to try out its new double-decker shooting range featuring a two-story steel funnel bullet trap. Nicknamed the Lotus 8/11 for the number of steel panels used to create it (eight panels on the bottom slope and 11 panels on the top slope), this version of Action Target’s Total Containment Trap is the first of its kind. Abell stumbled into the gun industry a few years back when he and a family member decided to go in on a gun store. It seemed like a crazy idea, he said, but with a little bit of luck and ingenuity, they just might be able to make it work. They found an existing building in Jensen Beach that met their needs but quickly ran into issues when it became apparent there would not be enough room for two adjacent ranges and a gun store. Abell did not want to cut back on the number of ranges, so the only option was to make a double-decker range where both levels shot into the same bullet trap. The answer was to extend the Total Containment Trap (usually just 8 feet tall) to a whopping 19 feet and to mount steel cross beams to support the Mancom Touch ‘N’ Go target retriever system. With the equipment issues resolved, the next hurdle was proper ventilation to prevent customers and employees from being exposed to hazardous lead dust. The sheer size of the room presented a unique challenge, so Lotus Gunworks enlisted the help of industry ventilation specialists Carey’s Small Arms Range Ventilation. 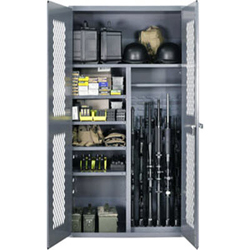 Despite doubts that a range that tall could be ventilated at all, Carey’s managed to create a system that not only met environmental standards, but exceeded ventilation standards for even federal shooting ranges. Aside from being environmentally safe by completely replacing range air every 80 seconds, all of the filtered air pumped into the range is refrigerated, which, according to Abell, is a pretty big deal in Florida. Lotus Gunworks is especially friendly to new shooters with a Ti Training simulation system that allows those completely new to shooting to try it out on a real gun equipped with a laser before hitting the range. Friday night fun shoots will also allow people to try out a variety of firearms including fully automatic rifles. 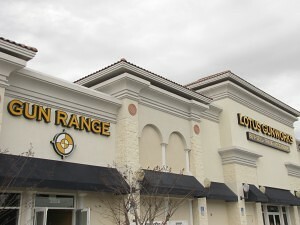 The range is expected to open for business the first week of April and will be holding a grand opening celebration April 20. Stone Hart’s Gun Club & Indoor Range has teamed with Action Target to build a progressive shooting range families can enjoy. Located near the Kendall-Tamiami Executive Airport, the new facilities include a firearm and ammo retail store, two indoor shooting ranges and classrooms for in-depth instruction. The idea for the range came in 2010 when three friends started playing with the idea of building a test range for their growing ammunition company. The idea soon evolved into something bigger, however, when they realized how few resources were available to shooters in the Miami area. Instead of building a range like all the others they had seen, they decided to create something that would have a positive impact on the shooting community. Stone Hart’s features two eight-lane 75’ ranges (one for handgun shooting and one for rifle shooting) equipped with the latest technology like target retrievers from Action Target with digital distance control and a Carey’s ventilation system that removes 99.7 percent of contaminates and lead dust from the air to keep shooters and the environment safe. But the owners believe the most unique aspect of their range is the family friendly environment. Stone Hart’s managing partners have gone out of their way to provide firearms education by hiring three professional trainers including former Top Shot contestant Gabby Franco to teach classes on self defense, concealed carry and shooting safety. Free seminars for children on gun safety will also be offered. In addition to educational classes, future activities will also include competitions, contest, games and ladies’ nights. Among their big plans are a deli sandwich counter in the pro shop, free cable and wireless Internet and future ranges for archery and tactical training. “Now that people have options,” Luna said, “it’s opening people’s eyes as to what a range should be. 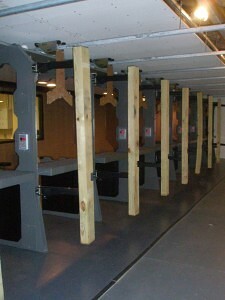 Find out more about Stone Hart’s Gun Club & Indoor Range or register for classes by visiting www.stonehartsgunclub.co. Action Target Inc. is a privately owned business headquartered in Provo, Utah. As a world leader in shooting range technology with more than 4,000 products and 40 patents for the systems it designs and manufacturers, Action Target has installed thousands of shooting ranges across the United States and in 25 other countries around the world. Action Target also designs systems and conducts firearms training for law enforcement and various military divisions. For more information on Action Target, visit www.ActionTarget.com. 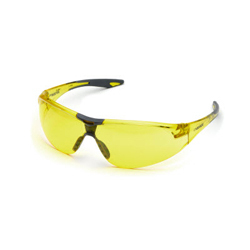 To learn more about Action Target products or to purchase items online, visit www.ActionTarget.com/store. At its most basic level, a rubber berm trap is approximately two feet of chopped rubber laid on top of an angled support structure to create a backstop or “berm” to catch bullets fired into it. There are several different approaches to this fundamental idea, but the same basic principles apply to them all. When you shoot into a dirt berm, the friction of passing through the dirt is what ultimately stops the bullet. A rubber berm trap works exactly the same way, with the obvious difference being the use of chopped rubber instead of dirt or sand. Because the rubber is a softer collection medium, ricochet and lead dust can be significantly reduced in some applications. Cross-range firing is safer, as is firing at extremely close distances. 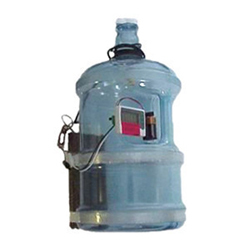 Such benefits make this trap an excellent choice for certain indoor ranges and other low-volume ranges where lead dust is a concern. Rubber berms aren’t perfect in every circumstance, however, no matter what you may read. In our experience, we’ve encountered several myths about what rubber berm traps and their accompanying accessories are capable of doing. Before you make any decisions on your range, make sure you know the facts. CLAIM #1: Action Target disapproves of rubber traps because all they make are steel traps. Not only does Action Target approve of rubber traps for certain shooting range applications, we have been manufacturing our own for more than a decade and have patents covering our unique berm trap technology. The hassle-free design of Action Target’s rubber berm trap takes advantage of the practical and beneficial properties of rubber, while eliminating the weaknesses and unnecessary elements of other designs. We recognize steel traps and rubber traps have very different benefits and limitations. It is important for the range operator to understand these issues clearly before choosing one technology over the other. CLAIM #2: Rubber berm traps capture all bullets whole and eliminate splatter and ricochet. Chopped rubber is obviously softer than steel, so some bullets can indeed be captured whole. However, that is not the whole story. After multiple rounds have been fired into the same concentrated area of the trap, newly fired bullets can begin impacting other bullets previously suspended in the rubber. As one bullet impacts another, both can begin to break into small pieces. 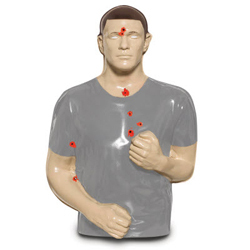 These “hot spots” of concentrated lead can form behind turning targets, indoor range target retrievers, and other fixed-position targets on your range and can pose a significant ricochet hazard if not managed properly. When cleaning rubber berm traps, it is not unusual to find masses of small bullet fragments that are nearly indistinguishable from bullet fragments taken from a steel bullet trap. Just because you are shooting into a soft substance does not mean the bullets won’t fracture and break up. There is still the chance for the bullet to strike another bullet, and that chance increases with every day of range use. Because rubber berm traps have no hard surfaces or obstacles to interfere with cross-lane shooting, they can be particularly effective in tactical applications where shooters move from one position to another and engage targets that are not directly in front of them. As long as hot spots are effectively managed, a rubber berm trap can also be a good choice for very close range shooting. CLAIM #3: Rubber berm traps are specially treated so they will not catch fire. There are many documented cases of rubber bullet traps catching fire. Most manufacturers, including Action Target, treat their rubber with some kind of fire-retardant substance to reduce the risk of fire, but without taking additional precautions, it is still possible to have a serious problem. You may see a demonstration where a piece of fire-treated rubber is held to a direct flame without burning, or you might read reports about tracer rounds being fired into rubber berm traps without igniting the rubber. These are unrealistic scenarios. 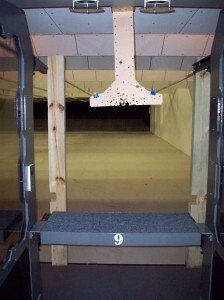 A full size trap on an actual shooting range can collect large quantities of unspent gunpowder and flammable debris from paper and cardboard targets. Also, bullets fired into the trap can break open chunks of treated rubber exposing the untreated surfaces inside. These issues alone may pose a considerable risk of fire, but the risk can increase dramatically if tracers or other incendiary rounds are fired into the trap – a practice that Action Target strongly discourages. A recent attempt to decrease the potential fire hazard of rubber berm traps involves mixing the chunks of chopped rubber with hydrated gel beads. The theory is that as bullets are absorbed into the rubber, they will be cooled by the gel to reduce heat build-up. Because no long term data seems to exist to support this theory, it is unclear whether the gel can keep a fire from starting or keep the fire from spreading after it has already started. It is also unclear what difficulty such a gel may cause when it comes time to clean the trap and separate the lead from the rubber. There are hundreds of things to take into consideration when building a shooting range, but your top priority should always be safety. Before anything else, make sure your range is going to be safe for your customers, your employees, and the environment. If you are considering building a range, talk to the Action Target representative in your region and he will be happy to help you find the right equipment to fit your needs and budget. You can also use our Request a Quote form to get started on your range upgrades today. Please note: the information included in this article has come from both documented studies and the personal experience of Action Target shooting range specialists. This information has been found to be helpful for many clients throughout the years but may not apply in all situations. Please use judgment in determining which tips will be helpful in your particular situation. While the top-level view of a commercial indoor shooting range may appear simple and direct, the economic reality is often the opposite. If one were to take the cost of a range based on today’s market value and implement a state-of-the-art range featuring approximately ten lanes, the initial investment would be well into the millions. A range costing a million dollars would require $50,000 in range fees just to cover the interest payment alone. If a range yields $10 per participant for each hour of range time, five hundred shooters would be necessary to simply cover that interest. In addition to start-up fees, heating and cooling of the facility can be substantial when variables like airflow and heat are factored in. Another five hundred shooters—if not a full additional thousand—would be necessary to cover the cumulative cost of operations and physical utility bills. This does not include costs associated with labor, maintenance, or any other expenses, causing the cost of an operation range to accumulate. Over the past 26 years of leading the industry, the men and women of Action Target have learned that an indoor range in and of itself is not as viable a solution as an indoor range used in conjunction with a retail store. However, a guiding principle sometimes forgotten is that a good range validates a good store. A good range makes it possible for a store to perform a service that dealers and stores without a range cannot perform. 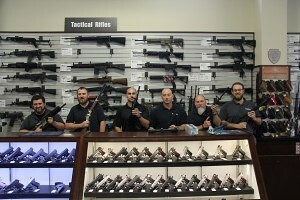 Clients can test firearms prior to making their purchase. Rental or lease programs are realistic possibilities, allowing for more informed decisions to be made. A singular offering like an on-site range provides a service unavailable elsewhere, meaning you are selling not only the firearms, but also a rare service–your expertise. Your ability to provide a critical service as an expert in the shooting industry, in conjunction with the services of a range, allows you to train and demonstrate that which you sell. A range also gives the opportunity for relevant, adjacent offerings, such as personal protection classes, concealed carry classes, and other things not available from people who would need to rent or borrow a range. With this in mind, reconsider the economic validity of building or purchasing a range. Supposing your range will consist of ten lanes, the last thing that you want to worry about it is the required maintenance. Any mechanical device follows a single objective rule—the more complex the device, the more expertise necessary in its service and maintenance. Just a few years ago, having an automobile with a motor, a carburetor, and a little common sense may have been the only necessary tool in order to adjust the carburetor. Today, however, the proliferation of computer controlled, microchip-fueled components makes it incredibly difficult to do so. Accidents or problems can necessitate repairs that are far more expensive now than they may have been ten or fifteen years ago. The laws of physics hold domain over any space, including ranges where bullets are being fired. Combined with constant historical trends of human innovation, we can see that whenever someone builds something to stop a bullet, someone else will build a bullet strong enough to go through it. Thus, it is only a matter of time before an equipment failure or breakdown on a range occurs. The value of simplicity, then, is clearly demonstrated. 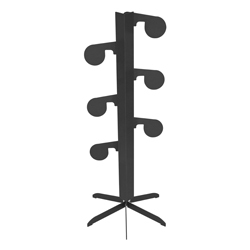 On a typical commercial range, there is no need for fancy, high-end target retrieval systems. The most cost-effective system on a range is a simple toggle switch on a track and a motor that takes the target down to a distance—this distance determined perhaps by a line painted on the wall or a line painted on the floor. This distance is determined and used as the operator runs the target down by holding the switch. As the operator brings the target back, they will run the switch until the target returns. While this may not sound like sufficient technology for training law enforcement, it truly is the only necessary mechanism for target retrieval. If you are going to donate your commercial range to local law enforcement, understand what that could entail. Even with donations of use, local law enforcement agencies’ use of your range will be a small fraction of its cumulative use. You will not be able to properly maintain your range or even break even based upon the rental of that range with your law enforcement under typical circumstances. *NOTE: This has been the first section of many Action Target White Papers being released to the public. All white papers can be accessed through our website. To read the rest of the Self-Funding Shooting Ranges White Paper, you can download the entire PDF document by clicking on the link provided. You can also watch the full video presentation. Addison is the Executive Vice-President and Co-Founder of Action Target. He has over 26 years industry experience and has personally designed, built, and maintained thousands of shooting ranges. Action Target is widely known for constructing the toughest and most challenging shooting range projects in the world. Working together as a team allows us to overcome various obstacles we face as we design, build, and create ranges for our clients. For example, Action Target was approached by the Federal Reserve Bank to design and build a shooting range on the 17th floor of a major office building in Chicago, Illinois. When considering the noise, ventilation, and other items associated with a range, constructing a range in a skyscraper surrounded by offices was a challenge, but not an impossible task for Action Target. Through careful planning and execution, we created a .50 BMG rated shooting range complete with three lanes, stalls, and retrievers. Every commercial shooting range project requires two key elements to get it off the ground- passion and hard work. 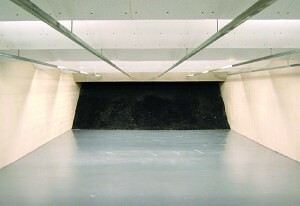 When it comes to Godfrey’s Indoor Range, Todd Godfrey had plenty of both in reserve when he embarked on this project. Todd, an officer with the Junction City Police Department, envisioned opening a commercial indoor shooting range to serve not only the citizens of Junction City and his fellow police officers, but also the soldiers stationed at neighboring Fort Riley. 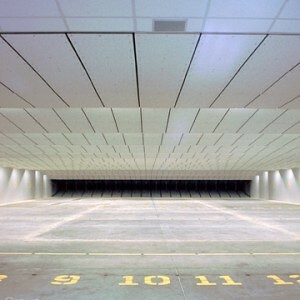 In 2008, Todd toured Kansas City PD’s 30 lane tactical indoor range with ATI Midwest Range Consultant Chris Hart and Bill Provencher from Carey’s Heating and Air Conditioning, as the two companies worked together to build this range several years earlier. After viewing the range, Todd decided that Action Target was the partner to have. With a visitor’s pass from Action Target, Todd attended this year’s SHOT Show where he secured everything he needed to run his range business, from firearm distributors to inventory software (we are also happy to help all of our future range clients attend the SHOT Show with us). For this commercial range, Todd secured some prime real estate in downtown Junction City–three vacant buildings totaling 20,000 sq-ft. on a main thoroughfare. However, this perfect location came with one catch–the building dates from the 1800’s. Building a range in a building this old would be challenging, but not impossible, for Action Target. Using ATI’s detailed range drawings, Todd began building out the structure to accept the modern range equipment. His company (yes, Todd has three jobs! ), Godfrey Construction and Renovation, LLC, installed new ceiling trusses and concrete work. He also remodeled the building with a new store front that includes a luxurious lounge area for those waiting to shoot. 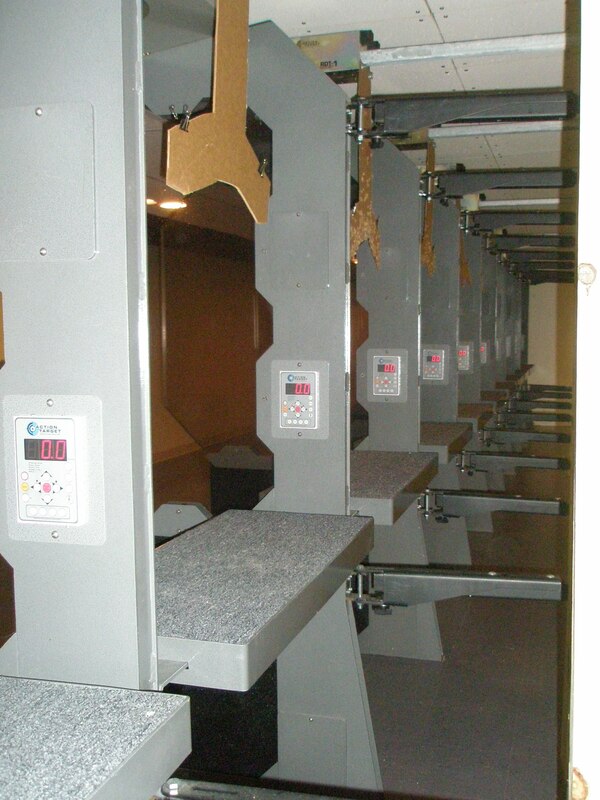 To accommodate the expected high volume of shooters, Todd chose Action Target’s Total Containment Trap with Dust Collection Unit, Rifle Rated Ceiling Baffles, Digital Smart Target Retrievers with SmartRange Master Control System and Level III clear Ballistic Glass Shooting Stalls. To enhance the realistic training environment, he connected the SmartRange system to his P/A system so he can broadcast sound effects such as gunfire, screaming, and sirens. The range also has police light bars to simulate felony vehicle stops. Carey’s provided a fully automated range ventilation system guaranteed to meet all OSHA and EPA regulations. 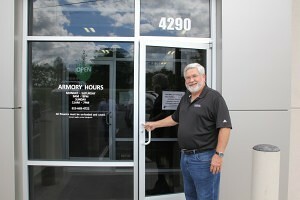 Godfrey’s Indoor Range opened to the public on July 31, 2010 and was named Junction City’s 2010 Business of the Year within five months of opening. However, that wasn’t enough for Todd–he then got creative with his extra space and installed a state of the art 6,000 sq-ft. 3D archery range. To further service his range customers, Todd leases 4,000 sq-ft. of retail space to Quantico Tactical. If you’re ever near exit 296 on I-70 west of Kansas City, do yourself a favor and stop by to meet Todd and his great staff and send a few rounds downrange while you’re there. Todd is currently available for consulting on range franchise opportunities and the construction of range facilities. Action Target is excited to announce the completion of the Shooters Edge Commercial Shooting Range and Retail Store located in Piney Flats, TN. This facility offers 5 Star accommodations and a clean and well designed atmosphere with extraordinary customer service. Having the help and dedication of Joseph Bush, Don Reimer, Action Target Great Lakes Territory Manager Jason Snell, Project Manager Bryan Dahlberg, Bill Provencher from Carey’s Heating and Air Conditioning and many others, allowed us to create a range that is innovative, effective and accommodating to all types of shooters. Tactical Baffle Layout: Provides for realistic training, including movement and shooting from any given point on the range with full errant round containment. 360 Degree Turning Target Retrievers: These retrievers for shooting range targets are perfect for decision making drills, qualifications, and tactical training. Also, includes Master Control for RSO. Track Runner: A running target that moves back and forth the width of the range. Shooting Stalls: Installed stalls came with lighting, keypads, barricades, and signal lights. Photo Eye Beam Security: Ensures all civilian shooters remain behind the firing line. Stalls with lighting, keypads, barricades, and signal lights looking at one of the targets hanging from the 360 degree turning target retrievers. 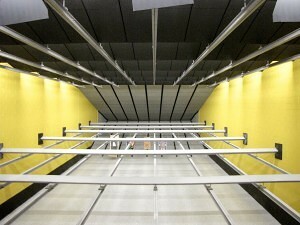 Stalls with lighting, keypads, barricades, and signal lights, including Photo Eye Beam Security. Congratulations Shooters Edge for a beautiful facility and phenomenal shooting range! If you are interested in our products and are in the Great Lakes area, contact your Regional Representative Jason Snell. For all other areas, please visit our Contacts Page to find the territory manager for your area.